If you’re in need of some adventure, experience the thrill of a local excursion with our Toronto to Kawartha coach bus tours. When you are in the midst of the Kawartha Lakes cottage country, you will feel like you’re in the middle of a player’s paradise. Feel the excitement of 450 slot machines, including China Mystery, Cash Spin, Cats, Kitty Glitter, Dean Martin, Double Diamond, Quick Hits, Jackpot Party and much more — or have a go at the Mighty Millionaire themed games for a chance to win one million dollars! Satisfy your appetite for fun and food all in one place at the Player’s Lounge and Café, featuring appetizing menu options for lunch and dinner and with available seating for up to 150 people. Get out and explore the great Kawartha Lakes — you don’t need a tackle box and boat to enjoy the sights and sounds of the city. The city of Kawartha Lakes is your year-round outdoor playground, offering entertainment and relaxation no matter the season. The beautiful Trent-Severn Waterway offers many recreational choices: In the summer, pack a picnic and head to one of many beautiful provincial parks or hiking trail, and in the colder months, enjoy a peaceful ski along one of Kawartha Lakes’ many trails – totaling 600 km! 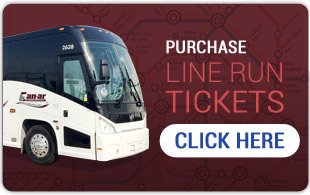 When it comes to transportation, Can-Ar Coach is there to help you with a range of Kawartha to Toronto coach bus tours.